Drainage of high temperature liquid from groundwater, extraction of leachate even contaminated from wells in landfills, raising of wastewater from industrial processes, hydraulic barriers. The pumps can not be installed in potentially explosive atmospheres. Multistage centrifugal electric submersible pumps characterized by floating impellers system that allows the pumping of leachate and charged liquid with small solid bodies. External pump case, delivery port, suction port, shaft and other components in AISI 304 stainless steel. Impellers and diffusers in special technopolymer. The check valve made of stainless steel is installed in the delivery head. Electric pumps produced directly with the meters of SK 4G1,5 electric cable required without electrical junctions. Available in AISI 316 version. Electric motor cooled by non-toxic, non-polluting liquid. 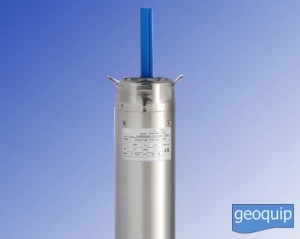 Motor protected by thermal switches resistant to temperatures of the pumped liquid up to 50 °C. The pump can not operate in dry conditions. Pump body always completely submerged. Temperature of pumped liquid: min 0 °C - max 50 °C. Vertical operating position (horizontal on request). Maximum immersion depth: 120 m.